August | 2014 | Wait…So That's What Catholics Believe?!?! Back in 1998, when I was taking classes to become Catholic, I ended up loving this Gospel passage about Peter being handed the keys to the kingdom of heaven. I studied it in detail and learned about all of the rich symbolism it contains: Jesus changing Simon’s name to Peter. Why it’s significant that Peter’s name means “rock,” which is lost to some degree when it was translated from the Greek to English. How the handing over of the keys to Peter references back to the reading we heard today from Isaiah, which speaks of the passing on of authority. All of this further confirmed that I was on the right path when I joined the Catholic Church in 1999. Why? You see there are a lot of different churches out there that you can join. All of them are made up of humans, obviously. Since humans are prone to sin, these church members can lose their focus or end up fighting amongst themselves. This has led to the fracturing of established churches and the formation of thousands of new churches throughout the world. So how does one decide which church to follow when none of them appear to be “perfect” according to human standards? For me, the logical sense was to find out which Church Jesus started to form in Matthew 16. I wanted to be a part of that Church. The one we hear about in today’s Gospel. 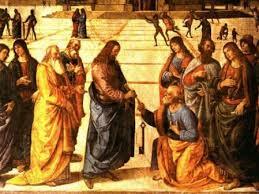 The one where Peter was named the human head by Jesus and given the keys to the Kingdom. The one where the gates of hell won’t prevail against it. “The oldest papal lists of which we hear anything were written down in the second century. About 150 A.D. Hegesippus, a Christian from Syria, visited Rome and drew up a list of the Roman bishops to his own day in order to satisfy himself and his countrymen of the validity of the Roman form of doctrine. His list contained not only the names of the bishops (popes) but also the duration in years of each pontificate” (From page xi of “The Book of the Popes,” Liber Pontificalis). This list continues to this day. Personally I think all of this is fascinating. I love Church history. But when I read today’s Gospel passage in preparation for this homily, I kept focusing on Jesus calling Peter to a very different path from his humble fisherman beginnings. Jesus gave him a new job. I think it hit me differently because I can relate. I’ve recently felt Jesus calling my family to a different path then the one we’ve been on for the past 11 years. My family moved here in 2003 to set up a Chiropractic office. It’s hard to say how we ended up here in Harrodsburg when our families were both from Ohio. But I can say that after we attended Mass at St. Andrew’s for the first time, we had a sense of feeling at home. That was a sign for us that we were in the right spot. Angie and I got involved in teaching Sunday school, I became a lector, we both became extraordinary ministers of Holy Communion, we helped with vacation bible school and eventually started working in youth ministry. Our kids received many of their first sacraments here at St. Andrew’s. I was ordained a Deacon in this diocese and was assigned to this parish. My first homily ever given as an ordained Deacon was from this very spot. So it’s been an odd experience the past few months to realize God is calling me away from this place. After much prayer and discernment, I have accepted a new job as an associate doctor at a Chiropractic office in London, KY. It was a great opportunity that I couldn’t pass up, but a very hard one to make since it means we will be moving away from this community. Our plans are to not try and sell the house for 6 months to a year so I can make sure everything is going well at the new office. So no tears yet, you still have to put up with the Wentz family for a while longer! Now, what does this mean for you? It means somewhere out there, Jesus is calling one of you to be the next youth minister to take over for me. It means one of you men has heard the call to the Diaconate, but maybe you’re trying to ignore it or are scared to acknowledge it. It means many of you will be harassed by Fr. Noel to help out since he won’t have me to boss around. 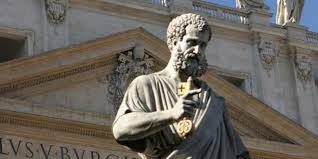 We are all part of the One, Holy, Catholic and Apostolic Church started by Jesus Christ that was entrusted to St. Peter and the Apostles. We have been guided by the Holy Spirit to bring Christianity to the world for the past 2000 years. St. Andrew’s is a small part of the bigger picture of Catholicism worldwide. We are the hands and feet of Jesus Christ. We all must step up to do our part. We must pick up where others leave off and we help each other out…even if that means Jesus is calling us out of our comfort zones. I encourage each and every one of you to do your part. Just like Jesus called St. Peter to be a leader in the early Church, he is also calling you to help grow that same Church now. So pray hard and ask God what He wants from you. Maybe it’s time you took a leadership role at St. Andrew’s by joining the Parish or Finance Council. Maybe he’s calling you to teach the faith to the next generation by becoming a teacher in our Sunday formation program. Perhaps it’s as simple as helping out at the annual Christmas Craft Bazaar coming up. We need lots of volunteers to help make the Craft Bazaar a success. This event alone has the potential to be a huge fundraiser for St. Andrew’s, but only if people are willing to help out (you can contact Rosa Browning to volunteer). Another way to support St. Andrew’s is with your money. I know the economy is still pretty shaky out there, but if we don’t get financial contributions, we can’t have any programs here at the church or provide assistance to those in need. If you do already give money, THANK YOU! If you currently don’t give any money at all, please consider giving something no matter how small. Every dollar helps. Similar to St. Peter, Jesus Christ is calling each and every one of us to help build up His Church. We are all not being called in the same way, but He has a plan for each and every one of us. So please help make a difference by stepping up and doing your part…continue to make other families, like mine, feel at home here…continue to make St. Andrew’s a vibrant Catholic community for many generations to come.